Director of Communications and Languages, College of Europe. Visiting professor, Director of Languages, Language Service (Natolin (Warsaw) Campus). Angela O'Neill is a native of the Lake District, England. After graduating from Leeds and London, she spent 2 years lecturing in various universities in Paris, and then 6 years teaching languages and specialising in the area of effective communication skills in London. Whilst in London she also became involved in Language testing in a communicative way, and was invited to participate in numerous Language testing projects . 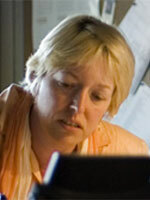 (She remains University of Cambridge Chief examiner for EFL in Belgium ). In 1989 Angela made the move to Belgium, taking up a teaching post at the University of Brussels( ULB).There she specialised in teaching English for academic and professional purposes in various faculties. In 2001 she accepted the post of Language coordinator at the College of Europe in Bruges, and later moved on to take up the position of Director of Communications and Languages. She continues to be actively involved in teaching communication and negotiation skills over the two College of Europe campuses, as well as overseeing and being involved in the daily work of the College communications office. Occasionally she is called on to train VIPs in communication techniques, and has acted as advisor to top level universities on Language matters. In 2005 she was awarded the honour of ' Chevalier dans les Palmes Académiques' by the French government, for her services to the French language.